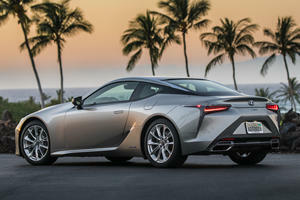 The LC 500h combines a 3.5-liter V6 gasoline engine and an electric motor to provide a total of 354 hp. A continuously variable automatic (CVT) and a 4-speed automatic transmission work together to provide 10 simulated gears that send drive to the rear wheels. Acceleration is quick but it is the superb handling allied with a great ride quality that really impresses. It also offers a beautifully finished cabin and a very comprehensive specification list that includes adaptive cruise control and full LED lighting. Available options include active rear steering and a color head-up display. The Lexus LC is an all new luxury sport coupe with space-age lines that look as if they entered mass production unaltered from a fanciful design concept. 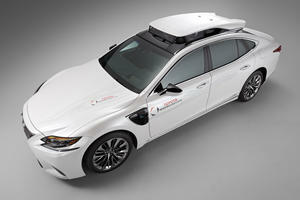 Equipped with the latest safety and technology features, the LC Hybrid adds some future-proofing too in the form of a gasoline/electric drivetrain that promises similar performance to the V8 LC500 while consuming far less fuel in the process. The stunning exterior styling of the LC 500h carries through to the interior, every surface is covered in expensive looking suede and leather and the long center console and swooping dashboard cocoons the driver and front passenger. A large diagonal infotainment screen is embedded into the dashboard and is controlled by the sometimes-fiddly Lexus style controller. The here are a pair of tiny rear seats which are best suited for shopping bags instead of humans, the trunk is one of the smallest around so you may find yourself using it for that purpose more often than not. The LC 500h exhibits similar levels of handling ability to the LC500 V8 and the quick-steering and sporty suspension give the big coupe excellent cornering capabilities. The chassis remains balanced when you push it hard and the brakes and transmission are both excellent too. The adaptive suspension allows for comfortable progress when you are in a less frenetic mood too, in comfort mode the ride is surprisingly supple and the LC Hybrid absorbs bumps and rough road surfaces very well. The hybrid drivetrain remains quiet on the highway and the interior is just as refined as the less sporting oriented Lexus luxury sedans. The LC 500h is equipped with a 3.5-liter V6 gasoline engine which produces 295 horsepower and 348 lb-ft of torque, this is complemented by an electric motor which brings the total power up to 354 hp. A continuously variable automatic (CVT) and a 4-speed automatic transmission work together to send everything to the rear wheels. These transmissions offer a total of 10 simulated gears. 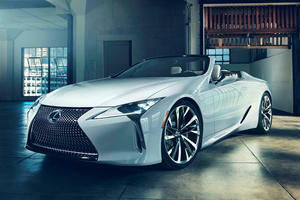 Lexus claim a 0-60mph time of 4.7-seconds, that is only 0.3-seconds off the time off the 471 hp 5.0-liter V8 LC500. The claimed highway consumption figure of 35mpg is very impressive although your driving style will have a marked effect on that number. 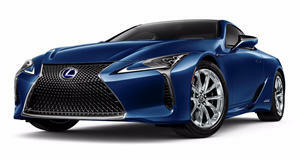 Compared to gasoline powered rivals, the LC500h is not the quickest offering out there but it is every bit as dynamic and responsive as the very best luxury sports coupes and the electric motor’s torque provides strong in-gear acceleration figures. The LC 500h is equipped as comprehensively as you would expect of a range-topping luxury coupe. The standard specifications cover just about everything most shoppers could wish for and some notable features include LED lighting, 10-inch infotainment display with navigation, 12-speaker audio system, adaptive cruise control, leather interior with 8-way power front seats and a range of standard safety systems such as automatic braking and lane departure warning. A number of packages are available for those who still want more, one notable omission on the list is the availability of Apple CarPlay and Android Auto. A Performance Package adds active rear steering, speed-activated rear wing, variable ratio steering, power sport front seats and carbon fiber details. The Convenience Package adds park assist, blind spot and rear cross-traffic alert while standalone upgrades include a head-up display, Mark Levinson surround audio system and 21-inch alloy wheels. The Lexus LC 500h offers shoppers a technologically advanced hybrid option in the predominantly gasoline powered luxury sports coupe category. The multi-stage transmission, seamless hybrid drivetrain and top-class handling abilities are complemented by a gorgeous exterior and interior design along with a full range of luxury, convenience and safety features. The rear seats and trunk are for display purposes only but the LC 500h offers superb refinement and a very comfortable ride marking it out as one of the best offerings in this competitive class. Every great grand touring coupe needs a convertible sibling.